As much as I love to be on the road, coming home is nice too. After all, you know you've changed as a person from your experiences abroad, but you will never truly see or feel that difference until you insert yourself back into the same environments and situations you frequented before leaving. It's like some mad social experiment. I bet you could see this one coming a mile away. A comfortable, familiar home with clean sheets, soft towels, reliable utilities, Mom's home cooking, stocked refrigerator and pantry, privacy, use of a car, and no nightly fee for a bed. I mine as well have returned to the womb! The key here is physical proximity to the people you care about, and vice versa. It feels great. Three weeks ago I went out to happy hour with my former bosses (like old times). They asked lots of questions and allowed me to unload as many stories as I could tell over a few drinks. I went up to NYC to visit my brother and friend too. Two weeks ago, I stopped into my old office and walked through the cubicles to see so many familiar faces. The reactions I received were wonderful. And of course, there is getting together with old friends and finding out what they've been up to while I was away. Generally speaking, the better the friend, the less likely they were to have followed this blog. I find this a bit strange, but don't hold it against them. A big aspect of why I enjoy traveling internationally is the challenge that comes with exploring countries in which you do not speak the native languages. On the other hand, when I returned back to the US and could suddenly walk up to anyone and ask for help, a movie recommendation, or a dance at the salsa clubs, it was a heck of a lot easier! It's nice to have a break from struggling to communicate all the time. 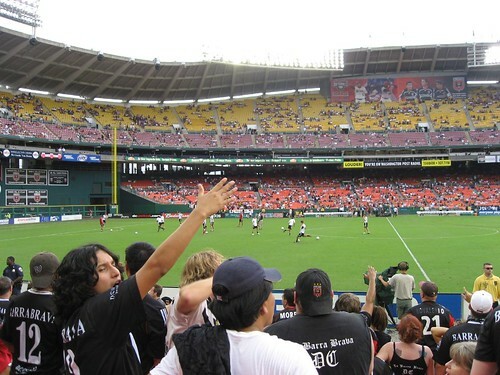 I made it a point to catch some great soccer matches while away – Sydney v. Melbourne, FC Barcelona v. Atletico Madrid, and 3 in Colombia (Medellin's rival teams – Nacional v. Medellin, Sao Paolo v. Medellin, and Colombia v. Peru), BUT nothing beats supporting my local favorite, DC United. The best offensive players haven't changed much, but everyone else has gotten mixed up and I'm still trying to get on top of the current roster. Not only am I looking forward to donning my United jersey for a live match, I'm planning to attend a World Cup qualifier, the USA v. Costa Rica, in October. Getting a new HP laptop in Colombia was a step in the right direction after having to rely on internet cafes and a tiny ASUS subnotebook for 16 months, and I did gain my first paid freelance writing experiences down there, but I've really been able to focus better now that I'm home. Learning to use Twitter and social networks more effectively, discovering new blogs, and moving forward with integrating my old static website into this blog with WordPress as the content management system are all the result of being in a familiar environment once again. I've wanted to start a yoga practice for the year since I left India, however I knew I'd have to wait until I returned home to consistently attend classes. For the last few weeks, I've been going to classes at my gym three times a week. Having practiced meditation for several years before my trip, I find yoga to be a related, though refreshingly new alternative. Aww such a nice list. I live in DC too and while I’m always glad to come home right now I’m about ready to get out of this hot, sticky, humid place! Thanks Stephanie, I’m glad Fall is just around the corner (another reason I appreciate being home). I’ll be sure to check out your blog! Love the photo – great lighting. Please tell more about blogging and travel opportunities. I love to travel, love to blog. Wishing you the best. 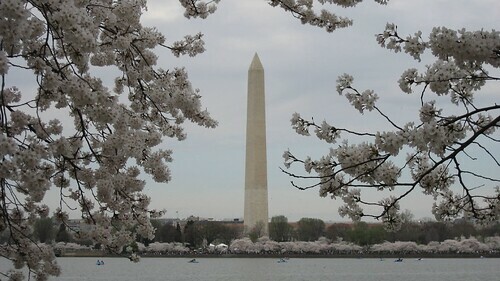 Thanks Marlene – the day I went to see the Cherry Blossoms after 15 years of procrastinating, was overcast! Really beautiful despite the lack of blue skies for contrast. Home is fun for about a week.. then it gets boring very quickly! Also, home friends dont really have any clue about travelling. Im usually itching to get on the road again. I have a feeling once I’m settled, and gainfully employed, living in NYC, I’ll be about ready to leave it all behind again and head for South America! I completely agree! I never think of it before my travels, as I’m always so excited to get to where I’m going. But upon return — especially if I’m somewhere out of the country — I learn to appreciate home more than ever. The last two summers, I was in countries with hot summers and no AC in the hotels (and hardly anyone had ice cubes). When I came home, I appreciated air conditioning and ice like never before. While seeing new places is such a blast, sometimes, nothing can beat the comfort of home. Hi Emily – thanks for stopping by!